Positive Social Impact Can Be Fun! 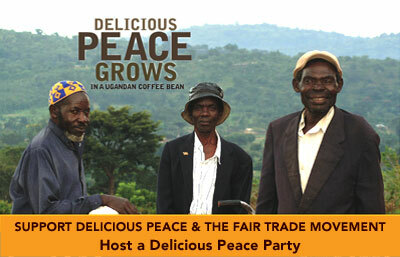 Delicious Peace is an award-wining film narrated by actor Ed O'Neill that tells the story of Christian, Muslim and Jewish farmers in a small Ugandan village who put aside their differences to form the Delicious Peace Coffee Cooperative, hoping to improve their lives and provide for their families. After establishing a partnership with a Fair Trade buyer in the United States, business expanded and the Co-op flourished. Out of their success grew trusting relationships, friendships, and greater peace and prosperity in their community and region. Celebrate the farmers and join the Fair Trade movement by using the film to spread their hopeful story and to inspire simple actions that can bring great social change across the world. Invite friends and neighbors to screen the film and enjoy delicious Fair Trade coffee and chocolate. Inspire your friends to "swap" at least one product they buy for its Fair Trade alternative. Learn the positive impact your "swaps" will have on people in developing countries. Experience how much FUN social change parties can be!! Signup to stay informed of how you can support the Fair Trade movement.